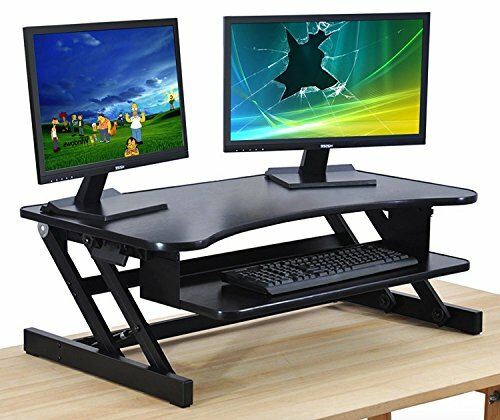 The DeskRiser is an adjustable height dual tiered workstation that sits on top your existing desk to convert your desk from a sit to stand up worksurface. Well constructed with an aluminum steel frame, unique ZINC ALLOY joints and a melamine 3/4 inch thick wood desktop, the DeskRiser allows you to switch between sitting and standing throughout the work day. This heavy duty sit to stand adjustable height standing desk helps promote better posture, reduced back and neck pain, a thinner waist line and increased productivity. Achieve long lasting health benefits and reduce your risk of heart problems, while at the same time boosting your productivity. Go from sitting to standing in 3 seconds with this stand up desk. Innovative squeeze handles and gas springs allows you to lift and lower the desk easily and effortlessly. 32" Wide x 24" D work surface easily holds two side by side monitors, a notebook, writing utensils, a coffee mug and your cell phone. Two-tier system keeps your keyboard and mouse on a separate surface below the top work surface and rises in sync with the top work surface. Keyboard tray slides in and out at any height. Keyboard tray is pre-assembled; no assembly required. This desk features monitor mount compatibility, allowing you to use the monitor mount of your choice. Adjustable Height Standing Desk - Adjusts your desk from sit to stand up in seconds. Move freely from a sitting to standing position throughout the day. Adjustable height range is 6.5" to 16.5". LARGE WORKSURFACE: Dual tier standing desk. Top tier is 32" W x 24" D, wide enough for dual monitors setup. Compatible with monitor mounts. RETRACTABLE KEYBOARD TRAY: Attached 24" W x 10.5" D keyboard tray slides in and out and rises up in sync with the top work surface. ZERO ASSEMBLY: Absolutely no assembly required.